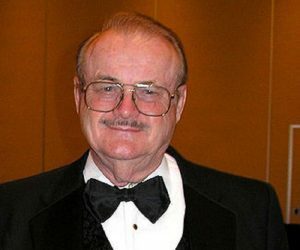 Jerry Pournelle, the noted science-fiction writer, political pundit and early computer enthusiast, is dead at the age of 84. Pournelle was well known to readers of the once legendary BYTE magazine. His Chaos Manor column, in which he reviewed software, hardware, new technologies, was very popular. Pournelle was a political conservative, one of the intellectuals behind Reagan’s Strategic Defense Initiative (aka. “Star Wars”) space defense program. He was a thinking conservative, not blinded by ideology; his views were based on facts and reason. I corresponded with Pournelle a few times, going back to the late 1980s, when I exchanged e-mails with him on BYTE’s long-defunct dial-up bulletin board, BIX (the Byte Information Exchange). Later, I was an on-and-off subscriber to his Web site and blog. I wasn’t a regular reader, and certainly didn’t always agree with him, but I liked to read his views. Pournelle suffered a stroke in 2014 and it certainly slowed him down. Even so, he never stopped writing. His passing is not exactly a surprise, but it still came a little too soon. May he rest in peace.